It was little surprise that the state of the economy took centre stage in the main opposition United National Development Party’s campaign platform in Zambia’s recent 2016 tripartite election. By MAKASA CHINYANTA. During the first few months of 2016, Zambia came to the brink of a near-economic meltdown. A decline in copper priced on the international market rendered the cornerstone of the economy – copper – virtually worthless. The result was nothing short of a socio-economic disaster – state mismanagement of relations with the largest copper mining firms in the country ended in the retrenchment of hundreds of copper miners on the Copperbelt, the province that until this moment had been the driving force on the economy. The uncertainty and the sudden economic insecurity was palpable. However, the reality is that what on the surface seemed sudden was the eruption of a situation that had long been coming to a head. And it was no surprise to many who cared to read beyond assurances of calm and the state’s claims that all was in order and under control (blatantly untrue propaganda issued by the country’s national broadcaster, the Zambian National Broadcasting Corporation). Far from being an isolated situation, the copper crisis appeared to be part of an Old Testament-style series of doom and destruction – things seemed to go from bad to worse. Unemployment levels in the country, steadily creeping upwards since the death of President Levy Mwanawasa in 2008, reached an all-time high in 2016. Freshly graduated students, eager eyed, sure of jobs deserving of the long hours of study put into earning their freshly minted degrees, quickly realised that there were just no jobs to be found. Finding themselves in a seemingly saturated job market, graduates became perpetual job hunters. For a lot of these graduates, many of whom had been unable to secure sponsorship in the form of government bursaries, their parents/guardians had literally sacrificed their last remaining resources, firm in the belief that the possession of a university degree was a guaranteed return on their investment. In the face of many complaints about the exponentially growing lack of employment, and one memorable “tomato campaign” staged by former University of Zambia students dressed in graduation regalia who set up informal market stands with “tomatoes for sale” signs, it became increasingly clear that graduates had begun to realise the apparent worthlessness of their university degrees. The state’s official response was a national call for graduates to seek financial security in entrepreneurship. The term entrepreneurship was bandied about so often by those in power that it haunted me, an unemployed graduate at the time, nightly. In practical terms, entrepreneurship to a large extent depends on the availability of financial capital, an extremely scarce resource for many of the people who were being called upon to “stop expecting handouts and think for yourselves, become entrepreneurs”. I hardly need express graduates’ frustration and anger with the regime in power at the time. Coupled with the extremely high unemployment rate, the economy’s over-dependence on copper, and the heavy spending on very costly (and poorly built and unplanned for) public infrastructure projects, the continued fiscal indiscipline of the Zambian government culminated in an inflation rate which saw the cost of living climb so high that Zambians began loudly to decry the cost of basic goods such as mealie-meal (the key ingredient of the country’s main staple food), which millions of people could no longer realistically afford to purchase. It was little surprise then that the state of the economy took centre stage in the main opposition party’s campaign platform in the 2016 tripartite election. The United National Development Party (UNDP) lambasted the ruling Patriotic Front’s gross fiscal irresponsibility and lack of economic diversification which had resulted in millions of Zambians seeing their livelihoods threatened, and their ability to access basic goods and services (the scarcity of medication in public hospitals, the frequent disruption of water supply for unacceptably long periods of time, and electricity load shedding) negatively affected. It was obvious, or so it appeared, that a change was not just desirable, but was necessary if the country was to be kept from hurtling towards total economic collapse. However, a difference of a mere 100,000 votes, a total of 50.4% of the votes cast, ensured that power remained in the hands of Edgar Lungu and the Patriotic Front. After a long and hard-fought electoral campaign period, which saw a style of press censorship which I would never have believed possible in a country like Zambia where freedom of speech is one of our most valued (and most widespread and indiscriminately exercised) rights, thousands of Zambians were shocked by Edgar Lungu being re-elected into power. The shock was understandable – here was a government headed by a man who, in the midst of a near-economic crisis, awarded both himself and his cabinet ministers salary increases, a president who, under the auspices of the Zambia Revenue Authority, used tax evasions as a reason for shutting down the largest and most widely read newspaper in Zambia (the media house best known for being intensely critical of the Patriotic Front’s regime), The Post. What had happened? People turned out in large numbers to vote, to express our discontent, to show our unwillingness to continue with the status quo, yet that was quite clearly not enough. We are now left grappling with the question: what happens when democracy works to our detriment? Lungu’s victory revealed three big rifts in the Zambian voting population. The first, a rural and urban poor majority who chose to show the Patriotic Front fidelity for rescuing them from the extremely poor governance and large scale corruption of the Movement for Multi-party Democracy (MMD) government in 2012, the guiding logic here appears to be better the devil you know. 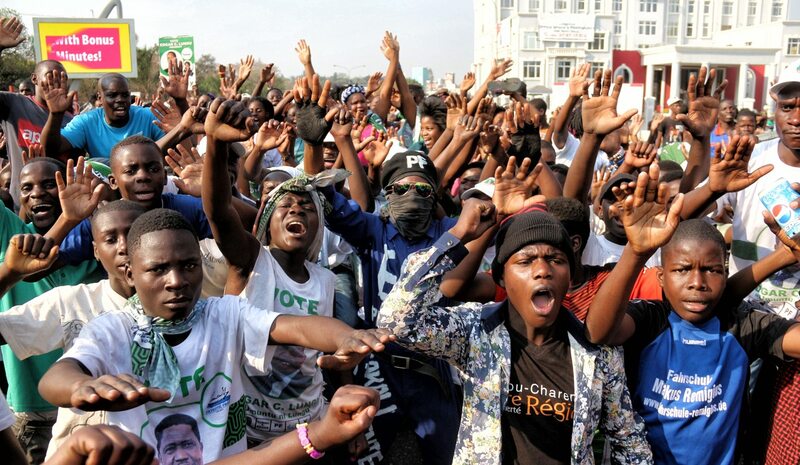 The second camp, a social-politically engaged youth who are of the view that the style and basis of Lungu’s governance of the country is neither beneficial to them (or anyone else save those who stand to gain directly from state coffers as well as a slew of tenderpreneurs), or economically sustainable in the long term. The third segment appeared to vote along ethnic lines. As regards this latter group, a countless number of Zambians were heard saying in the run-up to the election that they would never ever vote an individual of Tonga descent into power – a sentiment that has been voiced on other occasions when the UPND fielded a Tonga candidate. One of the largest ethnic groups in Zambia, the Tongas are perceived to be an extremely closed community and are therefore largely regarded with suspicion by other ethnic groups in the country. Democracy here, with its ties to utilitarianism, had, it appears, failed to provide the greatest possible good for the greatest possible number. We are clearly at an impasse. What we have been taught to believe is the best form of governance is quite evidently, and painfully, failing us. Beyond a purely theoretical discussion of the most just and the most representative form of government, the reality is that people are living through severe socio-economic injustice birthed by democracy, and we Zambians are not alone in this reality, and in this realisation.